It’s my 100th post and I’m overjoyed with more than 30000 hits so far and 129 followers. Thank you guys. Your support has been tremendous. Thank you all. I’m dedicating this post to Prof. Swaminathan, who has been my mentor always when it comes to Indian heritage. So, here we go. What happens when to Titans clash? Ok, forget it. We’ve already seen so much of it. Now, for a change what happen when the titans shake their hands. Any guesses… Come on… Try…. Ok, lemme tell you – A Coffee Table Book is created. Well, did you see that coming??? When and where did you see a coffee table book last – on a coffee table in a coffee shop, ofcourse!!! Ok, what was the book about – The National Geographic’s photos of the century, A big fat Indian wedding, Life of SRK or Brangelina??? Ok, anything about any culture or tradition??? Here comes the ultimate coffee table book on India esp. the most fabulous icon of Indian culture and heritage – Mahabs as I call it dearly, Mahabalipuram, as called properly. So, introducing the titans first. Dr.S.Swaminathan. My mentor in my interest and passion for the Indian cultural and architectural heritage. He’s one of the most interesting persons I’ve ever met in my life. Born in 1940, now a retired professor of Mechanical engineering in IIT Delhi, he has got this never ending love on Indian heritage. I can talk to him about Indian history, ancient architecture, music, dance, literature, languages, and my favorite topic textiles. His knowledge is vast to keep you so engrossed in the conversation. More important than his knowledge is his charming, lovable nature. I never feel intimidated talking to him. Many a times, it’s so intimidating to talk to some wise people, that they just snap you down at your ignorance. Its never the case with him. To talk to him, I did not require knowledge, all I required was the interest. Inspite of his seniority, he’s not just my mentor, he’s my friend. He is the author of this book. It was only through Prof. Swaminathan, I met Mr.Ashok Krishnaswamy. A fabulous maestro with his photographic skills. What Beethoven did with his piano, is what exactly what Ashok does with his camera – Creating everlasting, immortal masterpieces. He is the photographer of this book. So, the titans shook the hands and you really cannot expect anything lesser than the best. 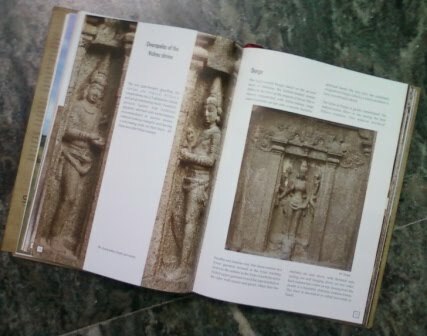 Though this book is essentially about Mahabs, it browses through several of the Pallava and Pandya architectures and sculptures scattered all over Tamil Nadu right from Kanchi Kailasanathar, Tanjore Brahadeeswara, Trichy cave temples, to Mamandur cave temples etc. 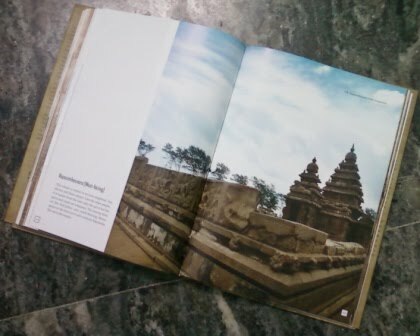 This book also browses through the Pallavas, Pandyas, Mutharaiyars etc who all ruled the southern region of India and gave us all those impeccable pieces of art, architecture and sculptures to us. 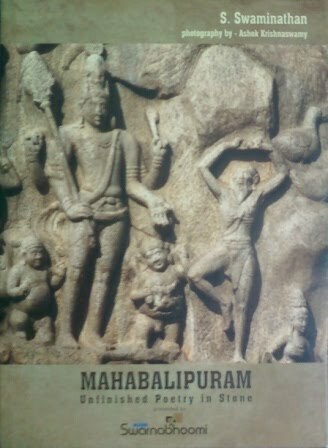 What would have been the mentality of the Stapathi (sculptor) while he did masterpieces of Mahabalipuram? Why did Narasimha Varma Pallava start out with the granite? Why this location? How big exactly is the physical area of Mahabalipuram complex? How far and wide did the Pallavas venture? What’s the designers’ perspective, the classisicm, the composition, the styling, the posture, the size and shape? What’s the historical perspective? What else other than bas reliefs and sculptures? What are the various Granthams (Scripts)? What does each and every character in the Great Arjuna/Bhagiratha Tapas Panel say? – Several such questions answered and several more doubts raised!!!!! To appreciate their art, we’ve gotta relate to it first. One I tried my hand in making wooden sculpture once. Not complicated, just a simple piece of contemporary art. It was fabulously difficult inspite of having a few machines to smoothen the surfaces etc. I completed the sculpture with a chipped off portion!!! I can actually imagine, how hard it would have been to sculpt with hard wood and granite is just mind boggling!!! I’m sure this book would help many to view Mahabalipuram as more than just a picnic or a school excursion spot. 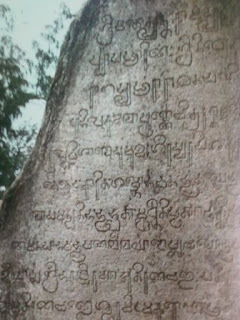 It’s a standing evidence of our ancient history, language, textiles, ornaments, devotion, and sense of classisicm! Yes, we attained classicism in the 7th C AD. It’s not the renaissance of Indian architecture; I’d rather call it the French Renaissance as the Pallavism of France!!! Here’s the proof for the photographic skills of Ashok. This is just a trailer. You’ve gotta buy the book to relish and enjoy every frame of the Mahendra overture oér a cuppa café!!! Credits: Photos and some terminologies are from the book reviewed. Here are my previous posts on the topics discussed here. Happy New Year. Good post from you as usual and many congratulations on your 100th Blog! All the best! wow.. congrats da busha.. its not an easy job to write around 100 travel articles. I appreciate your dedication my dear. Keep Going. I m expecting the printed version of your Travelogue soon. :) I ll be the first one to buy it. All the best da. More than everything else, your pleasant nature in addressing the visitors, have kept them interested through this "100"
Carry on, reach the sky, if it is the limit!!! Nice review busha... and what a coincidence...!! Congratulations for reaching the 100th milestone in your blogging adventure.You have indeed done a fascinating blogging work and gave us so much information about the history,sculpture,tradition and the wonderful places of interest in incredible India.I saw many places because of your daring adventures.Your photos supplemented beautifully your excellent writing and gave me the visual treat. It was interesting to read about your mentor and your glowing tributes to him. 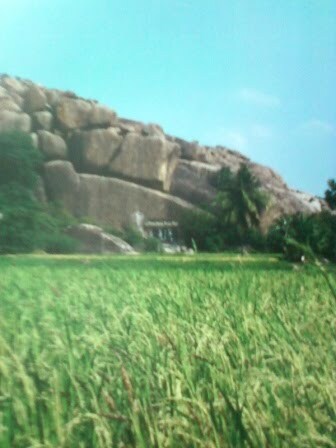 I have visited Mahabalipuram a few times when I was in school.I remember taking a photo standing next to a huge rock standing very precariously on a slope and appeared it would roll any moment.I wonder if that rock is still there perched precariously on the slope. Wish you more and more success.I suppose there are still higher peaks to climb. So interesting indeed. Great culture! Poetry in stone! The name says it all and it's beautiful! Wonderful post. Mahabalipuram is a nice place and every corner has something new to offer. நூறாவது பதிவுக்கு வாழ்த்துக்கள். பதிவுலகில் தொடர்ந்து சாதிக்க வாழ்த்துக்கள். Thank you all for your kind appreciation and wishes on my 100th post!!! Its all your inspiring comments and appreciations that keep my blog alive!!! Thank you all!!!! !